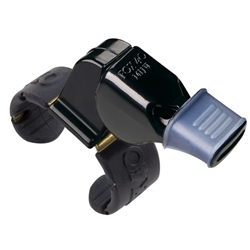 Fingergrip-style whistle in a compact size with the addition of the patented Cushioned Mouth Grip. Another choice for Officials who prefer fingergrip style! Same Mini function, same Mini power, same CMG style, in a compact size. The Fox 40 Mini Fingergrip Whistle is a compact version of the Classic Fingergrip Whistle, with a smaller mouthpiece. It has the same 3-chamber pealess design and ultra-shrill tone of the Classic.